Heat honey, vanilla and butter in a saucepan over medium heat and bring to boil. Reduce heat to low and simmer for 10 minutes or, until mixture becomes thick with a caramel consistency (do not let it sit for long off the heat, as it will begin to harden). While honey mixture is simmering, in a bowl, combine the orange juice, rind, cinnamon, nutmeg and brown sugar. Chop the walnuts and pecans and set aside. Slice each apple crossways into approximately 6 slices and dip each slice in the orange juice mixture. 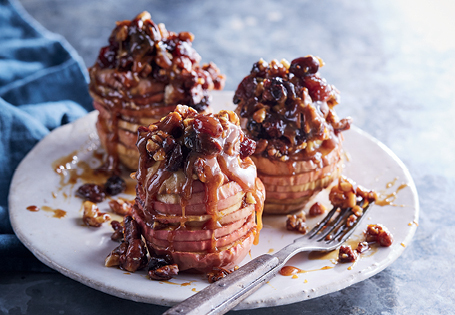 Reassemble each apple and place the stacks onto a baking tray. When the caramel is ready, remove it from the heat and stir in the sultanas, walnuts and pecans. Drizzle each apple with some of the caramel mixture and a little of the remaining orange juice mixture. Roast the apples for 25-30 minutes or until tender (if some of the caramel mixture slides off while baking, spoon it up and drizzle it over the apples again).